At Igero we don’t just “talk the talk” we hit the slopes, make birdies, take wickets, dive in, go for a run, and hop on our bikes at every possible opportunity so we know first hand what products look great, and perform even better. Our team of product selectors hand pick a portfolio of the latest most innovative, eye catching and technically advanced eyewear and sports gear each season. These products are showcased on the site and using our pioneering ‘try live’ technology it’s possible to virtually try on our collection of sunglasses and ski goggles to make sure the style you’ve selected suits you. Based on the edge of Salisbury Plain which is an off road running and cycling paradise, we couldn’t ask for a more perfect office location. Our team regularly take out products and road test them to make sure that they really are as good as they look. Sports wear is at its best when it can perform under pressure and offer luxury and style so we strive to bring our customers the most desirable sports luxe looks available. To us sport is a lifestyle not just a hobby, from committed amateurs to semi-pros the Igero team live for their respective sporting seasons. In the winter months they can be found battling the British weather and clocking up the miles on their bikes or getting in essential marathon training. Our ‘snowseekers’ set off to the slopes and love nothing more than skiing or boarding in the French Alps with friends and family. Come summer time they can be found spin bowling and fielding at cricket grounds across the south, and our cycling fanatics love nothing more than trailing the Tour De France in a camper and getting as close as possible to the action. For those that wish to be more hands on with their Oakley purchase then why not visit our Oakley ‘Vault’ store at Gunwharf Quays in Portsmouth, UK. Open 364 days a year, this is one of the busiest Oakley Vaults in the world. We aim to offer a full range of Oakley products at unbeatable prices. 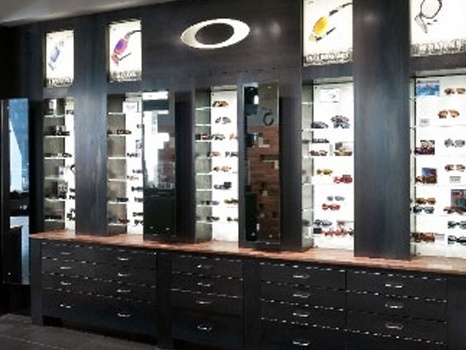 The store is manned by genuine Oakley specialists with many years experience. You can contact the store directly on 02392 296720. It is our wish that you enjoy shopping with us and hopefully become a regular customer, therefore we aim to keep the quality of our service as high as possible and our prices as competitive as we can. We are constantly striving to improve and enhance both your "on line" and "off line" experiences of shopping with us. We will only advertise products we can actually deliver. We have a "no quibble", simple returns policy. We have a knowledgeable and interested customer services team here to help you. We only stock 100% genuine products. We also frequently offer great promotions only available to those who have signed up directly for our newsletters so it pays for you to sign up, don’t delay - SIGN UP TODAY!